Eastern Energy Services has been supplying process densitometers to the oil and gas /petrochemical industry for over 25 years. The inline density meters are designed to measure direct density and can installed in applications where turbine flow meters or other fiscal meters need a density input so that a mass flow calculation is possible. 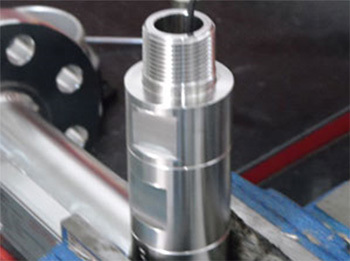 The units are normally supplied either as stand alone density measurement devices or with our watercut and sampling system package for crude oil metering applications. Many of our clients are integrators of fiscal oil and gas metering systems in the region. The most common type of densitometer we supply to projects is a vibrating element technology which is well known for accurate and repeatable density measurement in liquids. The built in temperature compensated oscillation circuit is sensitive to very small changes in density and temperature of measured liquid. The densitometers can be supplied with a larger selection of flange sizes and at request with USA or European ATEX certification. The need for continuous online density measurement and monitoring enables operators better control of the process. The units come HART ready and can be programmed at a distance from the actual installation site. In cases where density fluctuates considerably, the units can be combined with static mixers to create a homogeneous measurement and better average density. Singapore and Indonesia suppliers of viscosity metering instrumentation. Measuring liquid viscosity using the L-Vis. Installation example. The animation shows the working principle of the viscosity meter. Fuel viscosity control is a technique to control viscosity and temperature of fuel oil (FO) for efficient combustion in diesel engines of motor vessels and generators of oil-fired power plants. Fuel oil viscosity strongly depends on the temperature, the higher is the temperature the lower is the viscosity. For optimal combustion the viscosity of the fuel should be in the range of 10-20 cSt. To maintain this value a combination of viscometer, PID controller and heater is used. Viscometer measures the actual viscosity of the fuel, this value is compared with the set point in the controller and the command is sent to the heater to adjust the temperature of the fuel. Applications in the marine and power plants for blending and additive quality control. Fuel and Oil management. In addition, online analysers can be used as part of an inline blender to dynamically measure and control parameters such as viscosity, density and sulphur. These three are the most common for oil blending and blender feedback control systems. One of the primary measurements of bunker fuel is viscosity at 50 degrees celsius but bunker fuel is often not blended at this temperature hence the requirement for referencing viscosity measurements to reference conditions e.g. API/IP temperature volume corrections.